Police said Ray Lewis, 24, was fatally shot in the 4600-block of Harrison Street in Gary, Indiana. GARY, Ind. (WLS) -- Two people were killed in separate shootings overnight in Gary, Indiana. 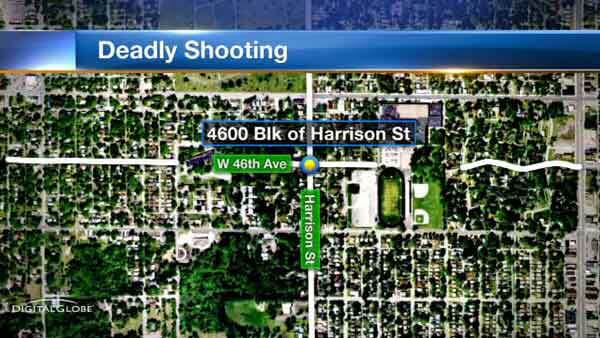 Police said a 24-year-old man was fatally shot in the 4600-block of Harrison Street late Monday night. Ray Lewis, of the 9100-block of Lane Street in Merrillville, Ind., was pronounced dead at the scene at 10:17 p.m., the Lake County coroner's office said. Another man who was hurt in that location was flown to a Chicago hospital. Police responded to a separate shooting in the 2000-block of Carolina Street around 12:40 a.m. Tuesday. Officers found a man dead on the ground. He has been shot several times. The victim has not been identified. The Lake County/Gary Metro Homicide Unit asks anyone with information regarding the shooting to contact (219) 755-3852. A man who had been shot several times was found dead by police in the 2000-block of Carolina Street in Gary, Indiana.